For unsurpassed water clarity, choose Jandy’s DEV Series of Diatomaceous Earth filters. 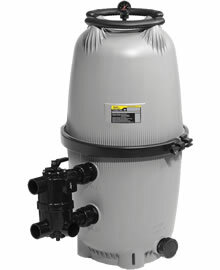 DEV filters have a curved grid design that create balanced water flow throughout the filter tank. Diatomatious earth, the natural water polisher. Diatomatious earth is made of tiny fossil exoskeletons. When used with the DEV filter, debris as small as 5 microns are trapped, returning highly filtered water to your pool.